VietNamNet Bridge – The unexpected jump in the GDP growth rate in the third quarter of the year remains controversial. 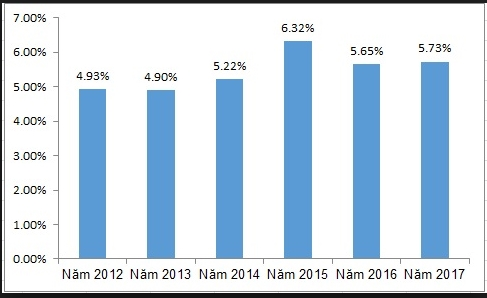 Head of the Vietnam Economics Institute Tran Dinh Thien, citing statistics about GDP growth rates in the last many years, said the ‘strange thing’ of Vietnam economy is ‘the growth rate is low in the first quarters, high in the last quarters, and the yearly plans are fulfilled’. Considering the GDP growth rate for a long period, he noted that the average growth rate had decreased by 1 percent every 10 years. Regarding the economic performance in 2017, the fact that the GDP growth rate soared to 7.46 percent in Q3 from 5.15 percent in Q1 is ‘enigmatic’ to many analysts. The unexpected jump in the GDP growth rate in the third quarter of the year remains controversial. The unprecedented jump was made in the context of low public investment disbursement and a sharp decrease of crude oil output, they say. However, according to Thien, private investment did indeed increase in the last year, while some business fields have witnessed sharp growth, including agricultural production. The service sector has also grown well, while foreign invested enterprises, including Samsung and Formosa, have made big contributions to economic growth. Thien praised the government’s role in removing obstacles and creating favorable conditions for businesses to develop, which has led to a record number of newly set up businesses. To create momentum for growth, Thien believes that in the next three years, Vietnam should not run after GDP growth rate every year, but should set other goals for economic development, of which GDP is just one target. Thien pointed out that Vietnam has overvalued the dong, which encourages imports, assembling, outsourcing and speculation, but not domestic production and exports. Large capital flows into the economy have led to many people having a lot of money, while economic activities have actually created little value. The fact that a few people got rich quickly has encouraged speculation and eliminated the efforts to create real value for society. The domestic sector remains weak and most enterprises still have not recovered their status before the crisis. The number of enterprises which pay corporate income tax fell from 60-70 percent of total enterprises to 30 percent in 2015-2016. The ratio of pre-tax profit on fixed assets and long-term investment of enterprises has decreased. In 2010, the ratios were 16, 7 and 5 percent for foreign invested enterprises, state-owned enterprises and private enterprises, respectively, but the figures decreased to 12, 3 and 4 percent in 2015. The number of newly set up businesses in processing and manufacturing industries only increased by 8.6 percent compared with the same period last year. Meanwhile, the growth rate was 62.5 percent in the real estate sector.